If only footballers showed as much commitment as Mick Robinson, the Peterborough United super-fan who has not missed a single league game for nearly two decades. Saturday’s trip to Swindon makes it 900 straight matches for Mick, a run which began in May 1997 after he missed a trip to Brentford where 15-year-old Matthew Etherington made his Posh debut. Since then, the fishery enforcement officer at the Environment Agency has gone home and away in the league non-stop, costing him an estimated £50,000. 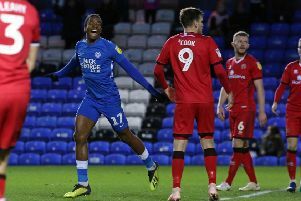 The only missing Posh match in this incredible run was a 3-1 win at Cardiff in the Football League Trophy in 2001 after Mick, of Walgrave, Orton Malborne, had already agreed to babysit his granddaughter. Mick, who first watched Posh in November 1959 in a Midland League match against Spennymoor United, has only missed four home matches since 1993. He started watching Posh with his parents while growing up in Market Deeping and now goes to every match with a group of friends. And he considers himself fortunate to be watching a Posh team who haven’t played in the bottom tier of the football league since 2008. “Since Darragh MacAnthony became chairman it’s been the best decade we’ve ever had,” said Mick. “Over that period one match which sticks in my mind is a 4-1 win against QPR at London Road on a Tuesday night. That was some of the best football we’ve played. “And the 1-0 away win at Colchester to get automatic promotion to the Championship (second tier) in 2009, that’s a good memory. “Going to the Championship, it’s like asking the best looking girl out. If she says yes it’s not going to last, but you enjoy it while you can. Family and finances impacted how many matches Mick could go to until 1997. But despite the inevitable lows of supporting a football club his love of the sport has not wavered, even after Posh’s 5-1 defeat to Bury last Saturday. “I came out feeling very down but I’m already looking forward to Swindon,” he said. Mick is Posh’s statistician and has published two books on the club. His favourite Posh player of all time is Dennis Emery, and over the last 900 league games it is striker Dwight Gayle. Mick now hopes to be following Posh for many more years. “There’s only two things that will stop me - finances or ill health,” he added.